Numerous requests to locate the full and unedited AOC segment from SXSW 2019. This entry was posted in Big Stupid Government, Cultural Marxism, Dem Hypocrisy, Election 2020, Legislation, media bias, Occupy Type Moonbats, Typical Prog Behavior, Uncategorized. Bookmark the permalink. I think that “Chiquita Krushchev” and “She Guevara” describes her best. I am sooooo down with that. By Jove, that one really works! I’m sorry, but WHO are the people who believe she is … attractive? Perhaps it is because she is so FAR from “my people” … but I find her oversized teeth and, frankly, dementedly over-exaggerated, grin to be frightening-looking. And her bug-eyes … oh my!! I suppose the only reason she is described as “cute” is because of her diminutive size. I understand that human males naturally gravitate toward TINY women as helpless, vulnerable, and needing a males protection. That this is part of mankind’s “reproductive strategy” imprinted on our DNA. I guess I am just more … evolved … in that when a woman is THIS dumb, irrational, and bug-eyed … I RUN as fast as I can in the opposite direction. Who needs THAT kind of lunacy in one’s life. Don’t forget the severe RBG hairstyle. I’m a straight female. I actually think Cortez is pretty, when she isn’t doing the bug-eyed fangs look like she’s totally whacked out on meth. I find her attractive. Let’s be fair though, most pictures shown on conservative sites are chosen to make her appear goofy. She has a bad brain … so there’s that one little thing …. First off during the Bloomberg administration she started a small business with the help of the Bloomberg program. She wanted together with others produce children book specifically for the children living in the Bronx. She failed and in the end defaulted on paying her taxes on that failed business which is around $1,800.00. Not a large amount by all means but that is not the issue. The issue is back then she believed in capitalism. The taxes remain past due to this day. Every since those days someone gave this goofy girl a major makeover and here she is. She and hundreds or thousands of others answered a Hollywood sponsored casting call posted on Craig list. It was placed by the CIA disguised group called “Justice Democrats”. She won and has been groomed ever since. She has a task and follows a script ergo her agenda is in communist ideas. Justice democrats are pure Marxists. Look it up and you’ll find who is behind AOC. Her twitter account is maintained by her partner who admires Nazi ideology to this day. Then there is the non-existent shell company issue where she and her handler funneled nearly one million dollars from the campaign donation hiding them from the FEC. She is not the only one by all means out of this current chaos trio because Tlaib also is hiding 70k she earned working for Soros well into the campaign not to mention paying herself two salaries although also reporting just a portion of the salaries paid out of the campaign dontions received. AOC – Justice Democrats = Explains the agenda and the who’s behind the rapid rise of AOC. THANK YOU for writing all that! This is information that most people still don’t know about but should! Especially those who continue to believe that AOC is the democratic ‘Cinderella’ who just showed up out of nowhere and won an election against all odds. THIS democratic ‘Cinderella’ has a ‘fairy godmother’ named SOROS. My Son has worked in the entertainment industry. When he was here on his yearly visit he pulled out a bag of makeup that is used when these people do public events. He said if you ever saw them without it you would be amazed. He had a small tube that they use for wrinkles that amazed me. (I called it plaster) Catch them without this makeup and they are scary. Satan’s got a new screen-saver. Maybe look at this explanation as it lays it out in pretty clear terms who AOC is and who is behind her? If there is corroborating truth to this theory then its pretty troubling and might explain a few things! 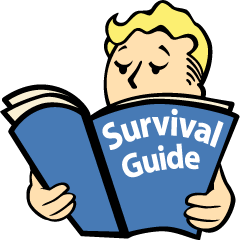 This video provides backup information that is more than a little disturbing. If the “Justice Democrats” success rate continues to rise, we are in deeper trouble than I thought. Big money will quickly move to an effective group that can give them control. I’m glad you posted this video as I was going to if someone hadn’t beat me to it. It explains a lot about her behavior. I agree. I saw this yesterday and it explains a whole lot about her. It’s horrifying. She’s a cut out. A Stepford candidate who parrots what she is told and is lost when she goes off script. This needs to get to everyone you know because the agenda behind her is very, very dangerous. The cute, little, quirky facade needs to be exposed, STAT! I am glad that I posted this here! I have been wanting to have a conversation, with many about this very dangerous situation, but my posts are being delayed now and perhaps even censored for whatever reason. I speak the truth that is all I am guilty of but some here can’t accept that for whatever reason! I hope Sundance does an expose on this to further explain whether or not this is indeed the case. Everything else we seeing on this site and others are mere distractions to what is really going on and its very troubling not to mention putting the country at great risk! I’m sorry. I just can’t do it. I feel like I am willfully rotting my brain out. Remember when Democrats thought Sarah Palin was empty headed, said dumb stuff and wasn’t ‘fit to serve’? Boy, Sandy sure has blown that argument to pieces. Oh well, let’s just tax the robots at 90% and move on. Like, for real, right? I mean, she’s like totally covering the whole thing in a very kinda smart, Gen Z sorta way. Seriously. Right? Who is paying for her to bloviate her insane ideas around DC? She obviously think she’s the cat’s a– and that everyone is hanging on her every word. To some degree Democrats are. Anyone ever hear of the Emperor’s New Clothes? See Jedi9’s video above. That’s who. Explains it very well. She is a puppet candidate. The goal is for more of these radical puppets in government. Of all the actresses her masters could have hired, the one who shone at the audition looks like a rabid mule? And sounds like narcissistic teenager? Leftists have no sense of aesthetics. I would so love to see this girl forced to debate President Trump. 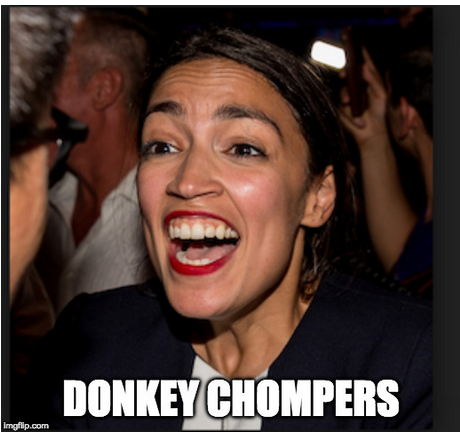 As revolting as donkey face is, the sad truth is that a big percentage of Gen Me, and Z think this inbred bartender is the bomb diggity- and these bearded wussies and SJW fat chicks LOVE her! Beware fellow Patriots this fool is an accurate representation of the generations born after 1980. I disagree. I believe there are a lot more Nick Sandmanns than AOCs in America’s newest generation. 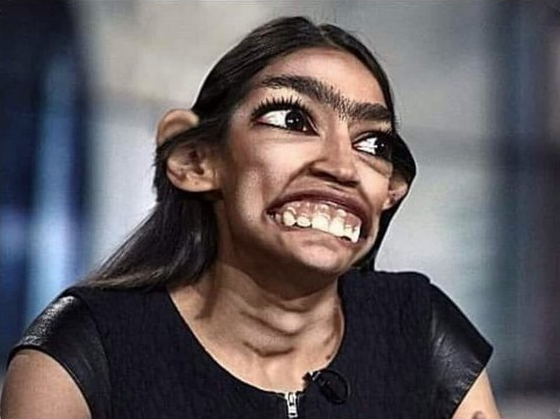 Meanwhile, I don’t really think AOC even represents the new face of the Democratic Party. That party, as we know it today, will most likely not survive the fracturing currently occurring within it. She MAY be the face of one of the SOMETHINGs that survives after the donkey party splinters into several factions; but, not likely the Democratic Party itself. True but so many are hanging on her every word. Even here in Austin Texas! How does this imbecile get a following? You put Abraham Lincoln in a group with Bill Clinton and Barack Obama? @ boogywstew… You get an A+ on reading comprehension… Not so much on US History if you’re not aware that Abe’s honesty and greatness was contrived by the media; OR, that he did more damage to America and the Constitution than any president before him. He’s probably only second to Obama in damage to America overall! Why do you think Lincoln is Obama’s favorite past president? At first I believed Abraham Lincoln was Obama’s favorite President and within a month or so of Obama’s election I realized Obama was a complete bald faced liar. It is undoubtedly a lie to mislead people into thinking he was in some way, middle of the road. The problem with your current and former opinion on this topic is that both are based on zero actual research of your own; but rather, on your random encounters with information that you just happened to cross paths with. I didn’t make my last sentence clear. Obama, himself, lied about his love of Abraham Lincoln to suggest that he, himself, Obama, was middle of the road. I was cutting you slack. Miss the Confederacy do you? What I miss is engaging in intelligent conservations with folks who don’t need to resort to posting meaningless comments that are not related to the topic under discussion. You can’t figure out the connection between my comment and the subject at hand? Do you need a hug? As I said above, your clarification proves I understood your comment perfectly. Do you need to take a remedial reading comprehension class to help you figure out the connection between my comment and yours? Here’s a hint: I DISAGREE with your comment about Obama. That may be, but just as President Trump tapped into the frustration and anger of his supporters, she has tapped into the frustration and resentment of those who see themselves as victims. She appeals to the desire all, especially the young, have to make a difference in this world. She’s telling them to have courage and to act upon their dreams of utopia. I wouldn’t underestimate her influence. Well, I certainly cannot disagree with anything you said there. But, all that does bring up another point about the media. >>> It is the media, along with the rest of the left, who created the concept of victimhood amongst AOC’s followers; as well as others, SOME of whom are in direct opposition in ideology to HER and her followers. That is why I keep saying the Democratic party will eventually skewer itself upon its own petard. >>> It very existence depends on its ability to continue fooling various opposing factions that it is their savior. Unfortunately, that party has also fostered the notion that every member of each faction is a victim who deserves special treatment and that others not like them are at fault for their victimhood. As AOC popped out of her SUV in Austin, Texas it would appear as though a part of her has grown…probably fake as well. Do you remember the pet rock? The crime is that SXSW used to be a pretty neat event with music, technology shows and NO left wing agenda. As Austin has devolved into leftist capital of the Texas Republic, the city has also ruined this once very interesting and diverse venue. Along with Dallas, San Antonio, Houston and the RGV. Yeah, great story, sweetie. Now fix me a scotch. AOC is not the only communist peddling wares in Texas. Look at the bill AMZN (looking @ you, CIAboy Bezos) got one of the Dimms to introduce in the Texas senate. Who can do that? I can’t listen to this woman for 30 seconds. Thanks to all who endure for the benefit of others. A high pitched grating voice that would leave marks on steel at 50 paces! Just for compassionate conversation, and for something to think about. Why are you drawing attention to skin colors (and perhaps favoring one)? the people that choose to illegally cross the border. are whom they are and try to illegally cross where they choose. And yes, this country has seen politicians (race baiters) before. Some make a living, using others as bait. Capitalism (economic system) is not about ALL other things in life. It is not the Judicial system, it is not the political system, it is not the Religious, nor the Transportation systems, nor about human relationships etc. But, a solid economic system can be a part of an equal opportunity for people’s life, liberty and the pursue happiness. Yes, there have been a plethora of company executives that have departed ways with an exorbitant amount of funds (and exploited the company and it workers)….some of which also seek to unevenly, influence politician$. You may ‘currently’ have a naive’ (or a coy) perspective of what ‘democratic-socialism’ is compared to some of your other party members whom are (untold) incrementally seeking ‘socialism’ (the empowering, tyrannical version). and vice versa, prevent the gov’t. from taking over corporations etc. is good…. (but some others have an untold, seflish hope for one, or the other). You say you are learning. There is a lot to learn (and to deter). Do you ever wonder if the dinosaurs thought that their life on earth would end in 12 years? Did the dinosaurs have a bias regarding water living, land living, flying reptiles – or their color? Did it matter? If so, was the life duration on earth something that the dinosaurs controlled or tried to control? But someone else’s (old) model of how we should integrate, have failed or on a path (or have been nearly on a path) of failure. This young new U.S. model is special…. we just got to fend off those that want to copy cat the old failed models. we do have clean air and water….thanks to our system. the (consensus) climate alarmists – and the simultaneous deniers of true science) being some of them are feared. We are thirsty… for truths…and virtuously share them. i.e. the climate does change, over time. It is o.k. Some are appreciative and glad that Spring is arriving…. The “serenity prayer” can help one to better cope with it, if needed. The above words are insufficient, but enough, for now. Thanks for posting the AOC interview. Just let her be. She is the wings beneath our feet……….. Nothing AOC says is meant for the patriots that voted for President, and it is specifically directed to the young voters .. it’s brainwashing .. and dangerous. Hold the line, and be prepared .. we only get 6 more years of President Trump … in six years .. The content of the character of the anti-fa, SJW, Liberal/Socialist/Comminist/Muslim extremist beings want “change” … almost forgot the decrepit evil one’s like soros etc. AOC is a groomed Identity Politics Actress playing a Congresswoman. The Justice Democrats interviewed thousands of people before selecting a bartender, AOC, as the person they could groom to run. None of her policy positions in congress are her own thoughts, she parrots what she is told by her handlers. Her key handler is Saikat Chakrabarti her campaign manager who is now her chief of staff. The Justice Democrats’ mastermind is Cenk Ugur of the young Turks who wants to take over the Democratic Party with new progressives. I saw some clips on TV. Regarding her disparagement of Reagan and his bigotry towards “brown and black working middle class” which she then goes on to describe by his criticism of “welfare queens”. How are black welfare queens “black working class”??? Her own arguments dispute themselves. not only is she ignorant beyond belief she is hideous inside out. Judging by the old saying, “What you don’t know can’t hurt you, Occasional Cortex is practically invulnerable. all i hear is oh but she is young and pretty, so is a venus fly trap. also people say oh but she is so smart, no just another fast talker who got her education from behind a bar with her ear towards mostly people with a blood alcohol of 0.300.as for school, going to a liberal college does not make you a expert on every thing she talks about. i will her her a BS ARTIST nothing more. the more she opens up her un-educated pie hole she removes all doubt on her i know everything attitude. with the 2020 elections coming up the demo-rats will need to shut her down,then again i hope they do not. She is dangerous in two ways. 1. She speaks to the basement dweller generation. The children that are holding out for a management postion generation . The parents are no good generation. You owe me and I deserve everything generation. The is to hard to raise my kids generation. The grandparents raising grandchildren generation. It’s the I know everything but live in with my parents generation. 2. As my grandmother use to say a dumb person who thinks their smart iare the most dangerous. Especially when their followers are just as stupid as they are. P. S. I NOT ALL KIDS LOOSERS SOME BUST THEIR BUTTS. I AM AFRAID THESE HARDWORKERS ARE OUT NUMBERED. The news media pushes AOC,on the American people ! Just like they pushed obama,hussein,on us!it’s a shame! AOC is proof,that the liberal news media has a radical agenda,and it’s not good !